Indoor Farming is the future of urban farming. It allows for vertical farms that grow all crops, in any place, at any time. This project researches and illustrates why, where and how high tech indoor farms should be integrated with the urban landscape. They render the old, centralized way of doing horticulture obsolete and promise a high capacity local food production that biological farming is unable to deliver. The current organization of the world’s food production and distribution is under pressure. New economies and increasing urbanization ask for more, better, safer and more secure production capacity, while growing land and water shortages, climatologic problems and plagues lead to an increase of food crisis. Today’s centralized food production, with crops being grown where the climate conditions and land values are favorable and/or knowhow is available, is no longer sustainable. It results in long and complicated supply chains, poor food quality and enormous food losses of up to fifty percent. In the last decade, new urban farming initiatives that promote biological and local food for the city seem to pop up everywhere. However their market share is still very small. It is very much the question if these sympathetic initiatives, as long as they are based on (semi-)traditional farming technology, are capable of generating a structural change in our global food system. They are relatively inefficient, require literally lots of space, produce a rather limited variety of products and rely on unreliable climate factors and sources. With the new technology of indoor farming, developed by Plantlab and other pioneers, new opportunities for efficient local food produce for the city arise. Instead of relying on existing climate conditions like traditional agriculture and greenhouse farming, Plantlab introduces a very compact crops production method with 100% control over the growing process, independent of climate, place and time. The method of Plantlab is based on indoor crops cultivation in climate rooms, so called ‘Plant Production Units (PPU’s). These PPU’s are equipped with fully automated installations, including LED lighting systems, creating the ideal growing circumstances for the specific crops inside. This method makes it possible to grow practically all types of fruits and vegetables on any location. Not only does it increase the quality of the food, it also consumes far less space and water than any other form of crop farming. Because it is no longer depending on natural sunlight it is possible to stack the different production units, and create vertical farms. At the moment, Plantlab’s system is commercially viable for specific high quality crop products such as spices and medicine. The prognosis is that in the near future, when the LED technology is improving in terms of energy use and price, many more applications are ready for the market. How should the new indoor farming technology land in our urban environment? 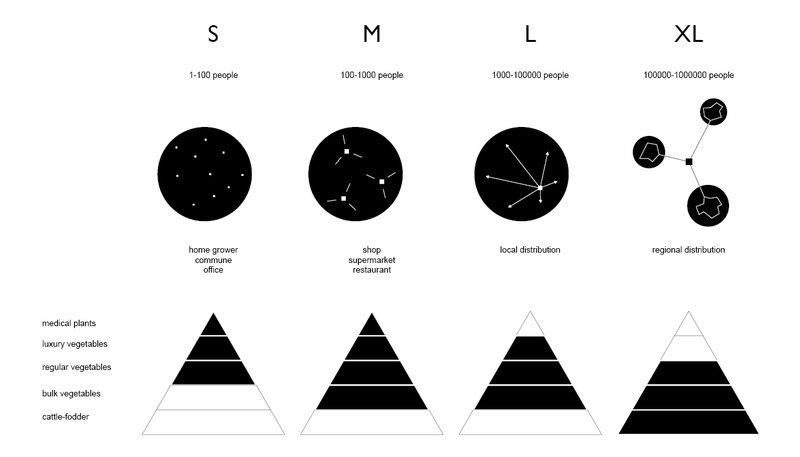 Indoor farming can manifest itself in and around the city on four scale levels: S, M, L and XL. Each level is characterized by a specific application of the indoor farming technology and relates in different ways to its context. S and M farms function on the level of the building. Restaurants, hospitals, offices and even households can start their own production unit for private or local use. Also supermarkets are able to produce part of their vegetables in the house. These small scale initiatives play an import role in generating awareness and social acceptance of high tech indoor farming. In order to achieve a real paradigm shift in global food production, indoor farming has to be realized on L and XL scale levels. On this scale, the system can benefit from existing automation technologies that are currently used in greenhouses. 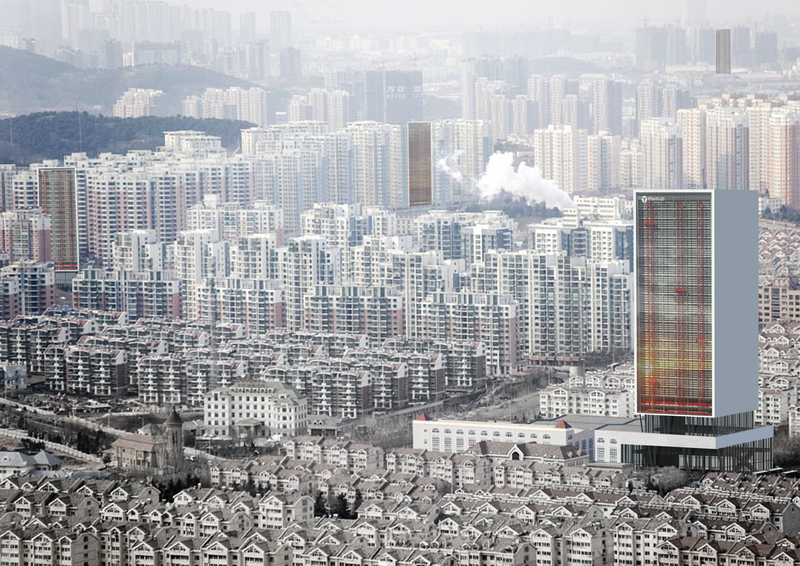 This allows for an unprecedented production variety, capacity and efficiency in the urban environment. 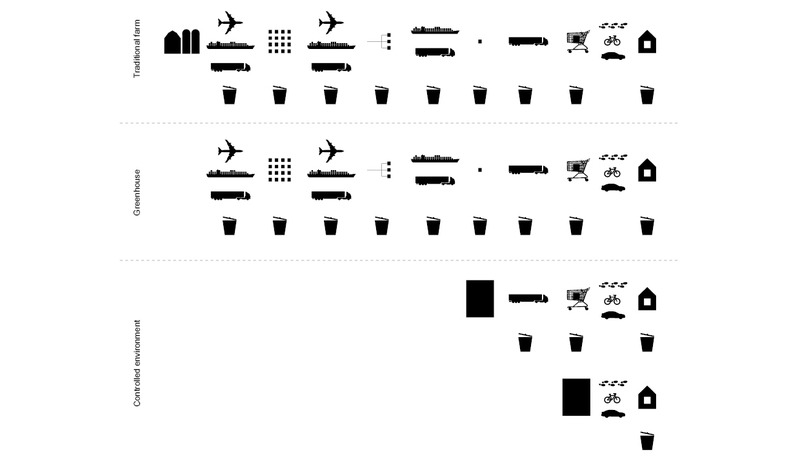 The autarchic city in terms of crops production will eventually combine all scale levels: from the micro scale of the household to the macro scale of the indoor green port. 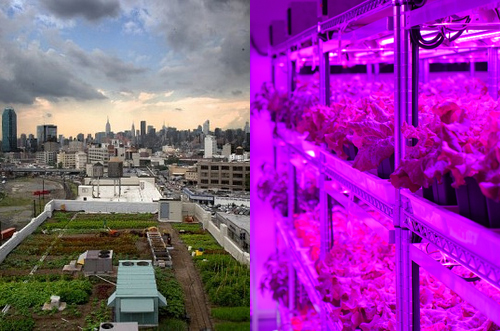 Large and extra large indoor farms can be realized in the urban landscape in a variety of ways. 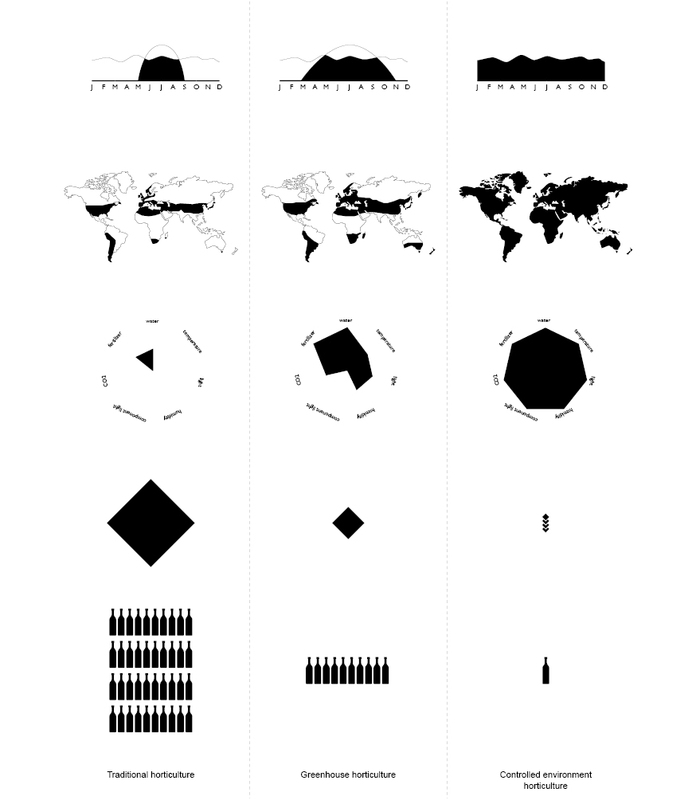 Their modular and stackable character allows for site specific farms that are integrated in the context. The denser the context, the higher the indoor farm will become. 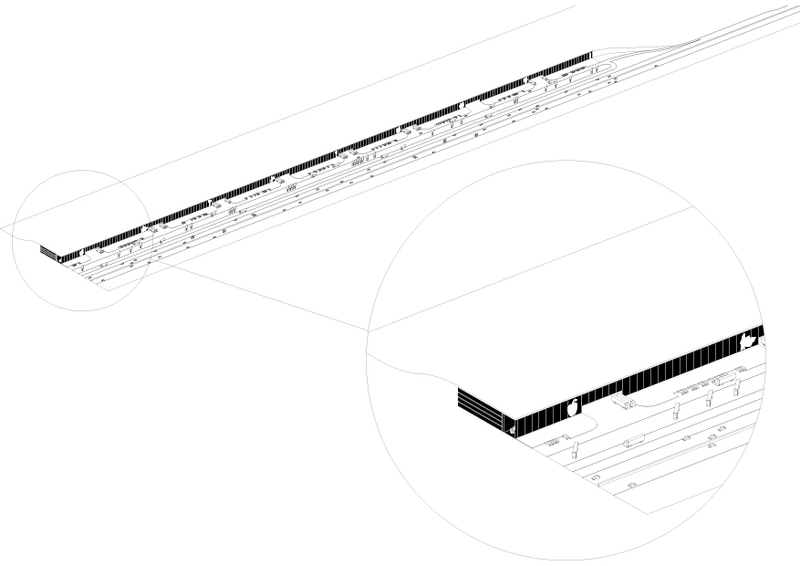 In the compact city, the indoor farm will take a vertical layout with dozens of cultivation layers on top of each other. 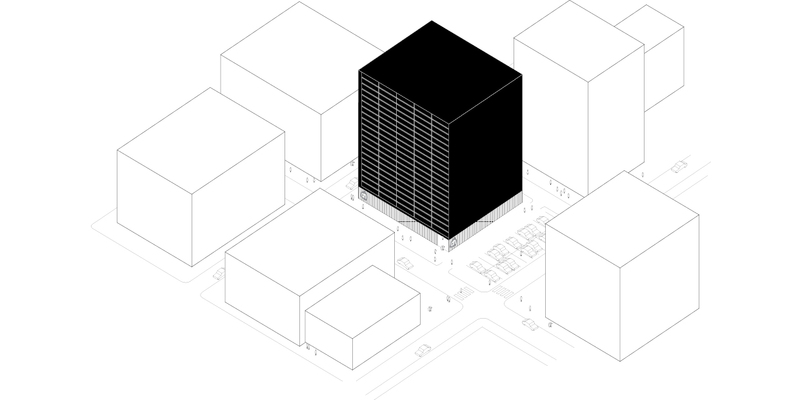 Their compact footprint will accommodate food retail units that form the interface with the city and its consumers. 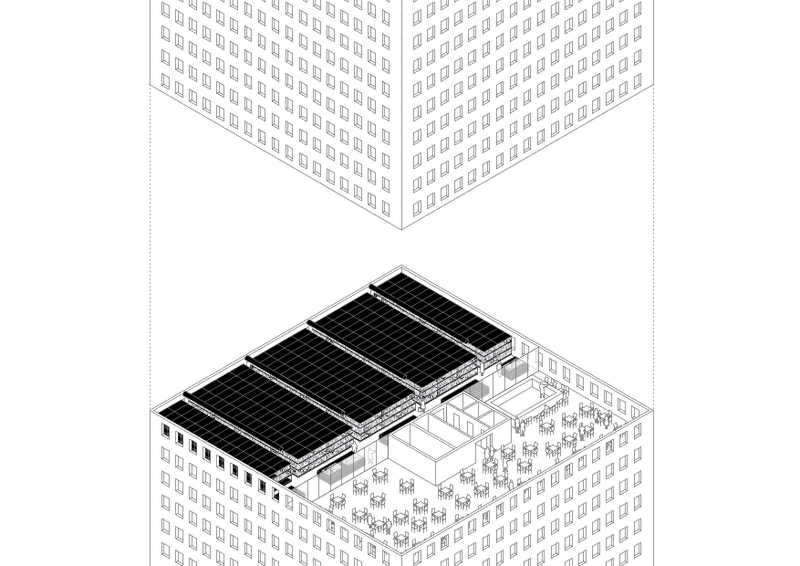 The possibility to stack indoor crops production allows for vertical farming towers right in the middle of our cities, the place where a lot of end consumers live and work, but space is scarce. Despite of their small footprint, these vertical farms can generate large, varied and year-round volumes of fresh fruits, vegetables and spices. 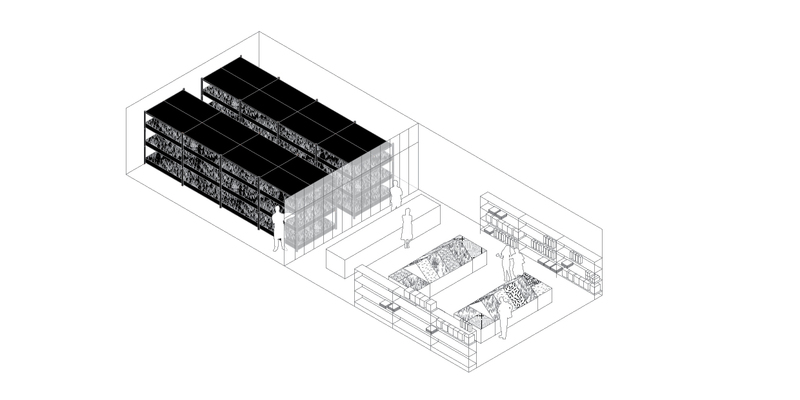 In the periphery of the city, the indoor farm will acquire a mono-functional and industrial character. Outside of the city, large scale indoor farming green ports will arise that provide food on a regional scale. These large complexes can manifest themselves as integrated landscape elements, connected to the existing infrastructure. In all cases, indoor farming has to be combined with sustainable energy farming and/or the use of urban waste energy. 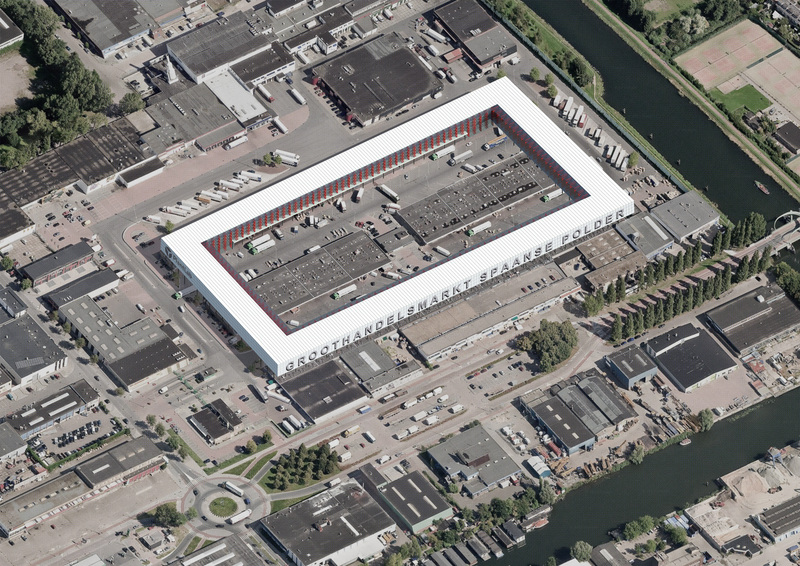 The rational layout of the Dutch polder lends itself for large scale indoor farms designed as geometric elements integrated in the mondrianesque landscape. 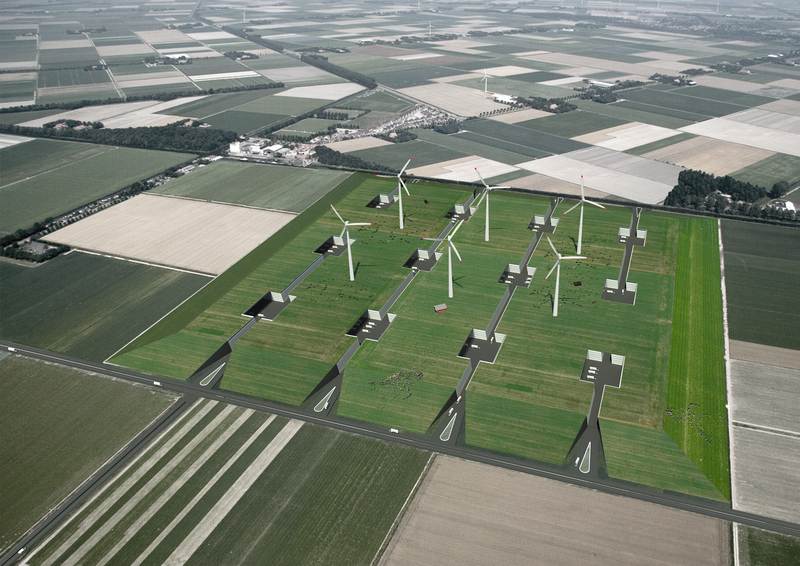 They charge the polder with new agricultural production value and enable the surrounding old fashioned farmland to grow bulk crops, have milk cows or transform into recreation areas and energy farms that supply sustainable wind energy to the indoor farm. The new XXL polder farms will become green ports that produce high quality crops for the region. Large scale indoor farming on the level of the region can be integrated in noise barriers along the highway. 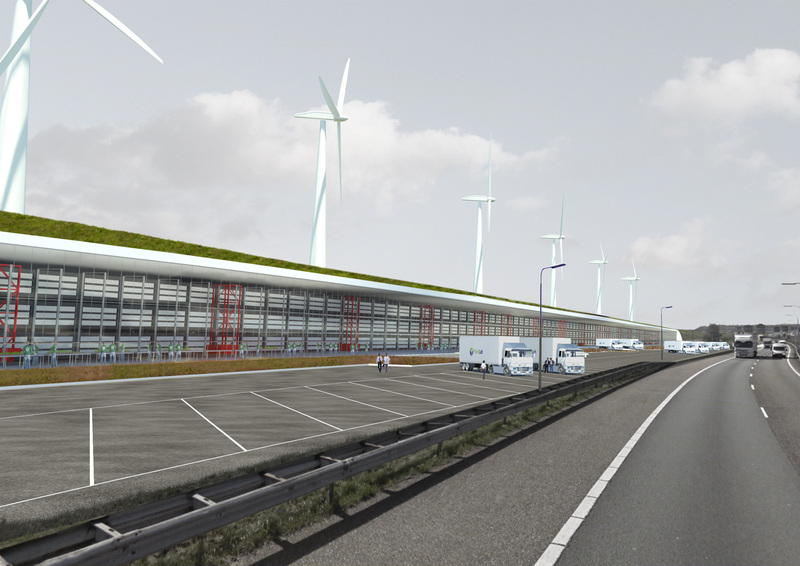 These new highway farms are directly connected to the Dutch highway infrastructure from where the regional distribution will take place. Highway farm A4 becomes a linear green port that provides food for Randstad West. Its internal logistics, in particular the vertical circulation of the crops, shows itself clearly to the car traveler by means of a glass façade that separates the crops elevator/lift machinery from the outside. The current food wholesale in Spaanse Polder, Rotterdam, functions as an important food hub for business to business distribution. 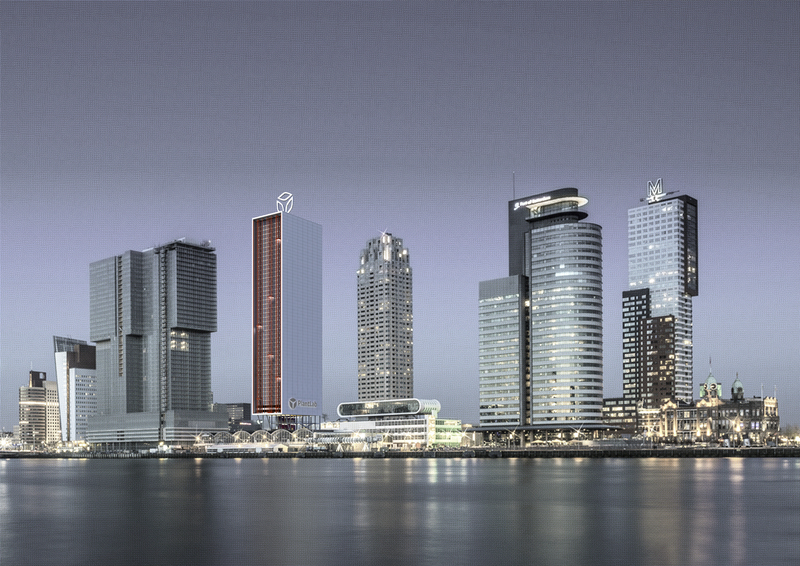 It is being supplied, via Roterdam harbor, by crops that have travelled from all over the globe. Indoor Wholesale Farm positions the production of practically all crops, right there where the food is being distributed. It reduces the food miles to the regional scale only. 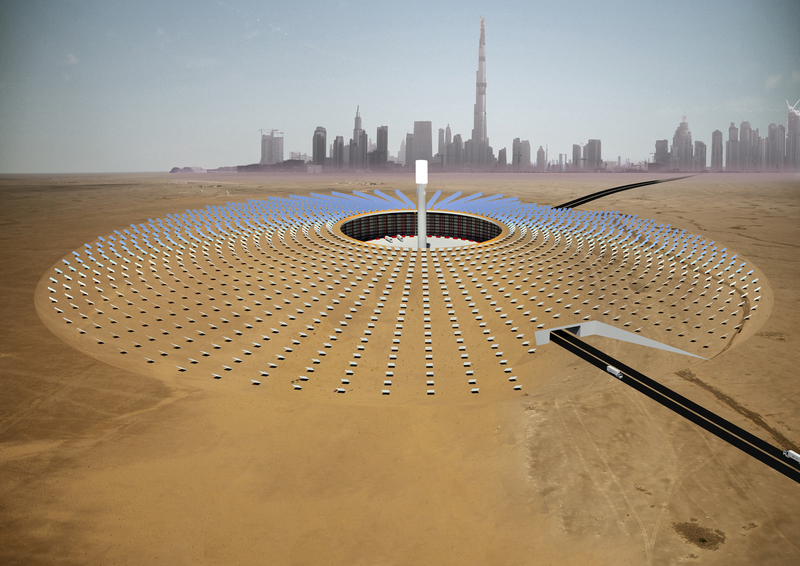 Densely populated desert cities can locally produce their own food supplies with large scale indoor farms, powered by solar farms.